Andrew Alpern gave a talk at the New York Public Library a few weeks ago about the newest edition of his book “Holdouts! The Buildings That Got in the Way.” He ended with a neutral statement: “Holdouts are neither all good nor all bad. They simply are.” But it seemed to me that his sentiments leaned toward the negative. Holdouts are the people who refuse to sell their property to make way for new developments. 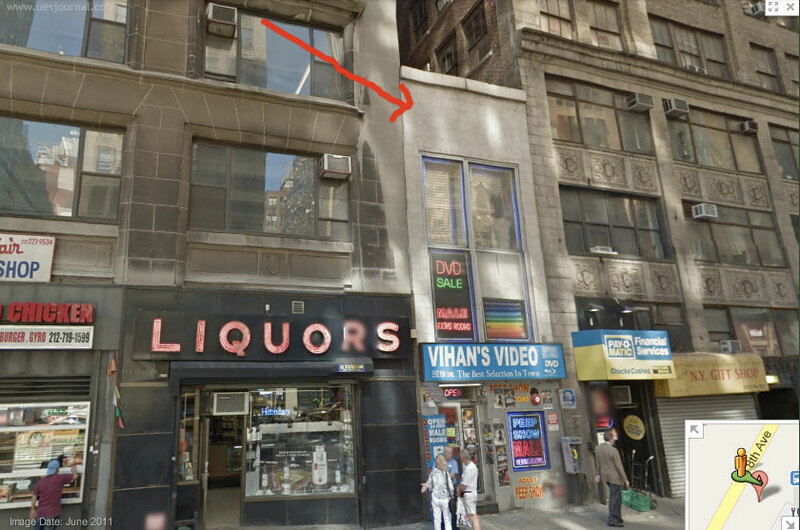 You can see the results of holdouts throughout the city, wherever a tiny building is squished between two towers (one example: 592 Eighth Avenue). Maybe most holdouts are crotchety, miserable people but as someone who has lived in the same building her whole life, and who appreciates stubborn eccentrics and comical incongruity I felt myself bristle a little at this attitude and wondered what others in the audience thought. 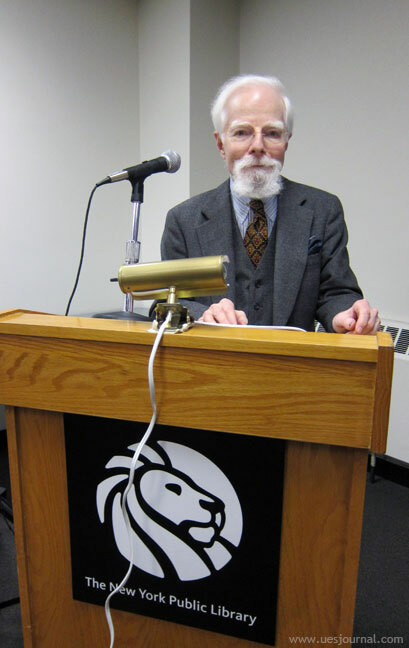 It was an audience of at least a hundred at a free lecture on the 6th floor of the Mid-Manhattan branch of the New York Public Library and appeared to contain a sizable demographic of likely New York City holdouts, if ever I saw one. Many audience members were above middle-age, a little disheveled, carrying reading material, and a woman in my row had lots of plastic bags and was wearing many layers and asked very articulate questions in the Q&A, after. Later in the talk, Alpern went on to comment dismissively about “some preservationists” in the city, again causing me discomfort and some confusion since I did not expect to hear this coming from an old, architectural historian in a three-piece suit with a watch chain. But, what he said next put me in my place. Have I been too sentimental? Too sad when any establishment I patronized closes (R.I.P. Old-Fashioned Donuts on 86th Street)? Why else would I have such a fondness for the “Citicorp” Building which I had to draw in elementary school? Besides the preservation of grand examples of architecture and history, like Grand Central which was nearly lost to new development in the 1960’s before enjoying landmark status, I have always enjoyed encountering tiny, ramshackle remnants of the city’s past, remnants with no visible reason for preservation, whose survival must only be a testament to someone’s sheer stubbornness or a failure in negotiations, some accident. These anomalies are amusing but do they serve any other purpose? Now that I thought about it, maybe Alpern was just pragmatic, realistic, appreciative of history and beauty, but mostly practical and unsentimental. He studied his subject with a scholarly detachment. Or, maybe his penchant for progress was influenced by co-author, mega real estate developer, Seymour Durst. The only whiff of preservationism I thought I sensed from Alpern was when an audience member asked whether the survival of a particular building that has remained intact for over 100 years (It may have been the Knox Hat Building but I am not sure) was the result of a holdout. Alpern replied that he did not think so because everyone appreciated this building’s historical and architectural value and no developer would have even suggested tearing it down. But, this was more of a historical analysis explaining why the building still existed and did not reveal whether Alpern himself thought the building deserved to remain. Either way, I decided, while Alpern is there to study and interpret the aftermath of development or lack thereof and to dig up and recount interesting stories on the subject, there will always be some greedy developers who give no thought to history or preservation and therefore we need crotchety, crazy, stubborn holdouts to balance the scales.